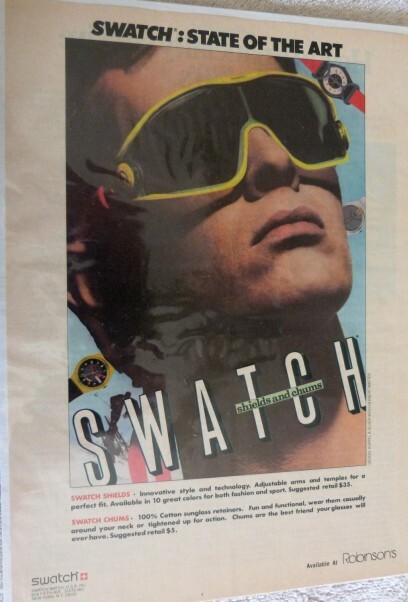 Old Swatch Ads from the 80s! 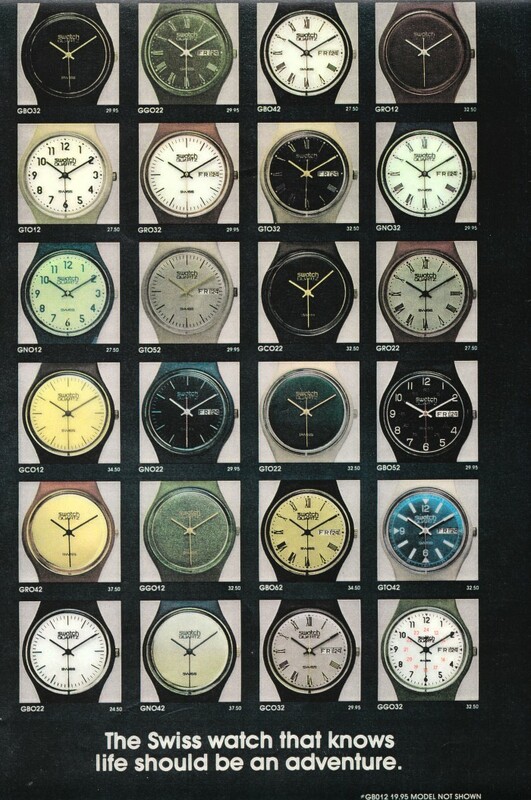 This a four page leaflet from the US showing the 1983 collection (the "famous 25 first" 1983 Gent Swatches), released in March 1983 in the US. 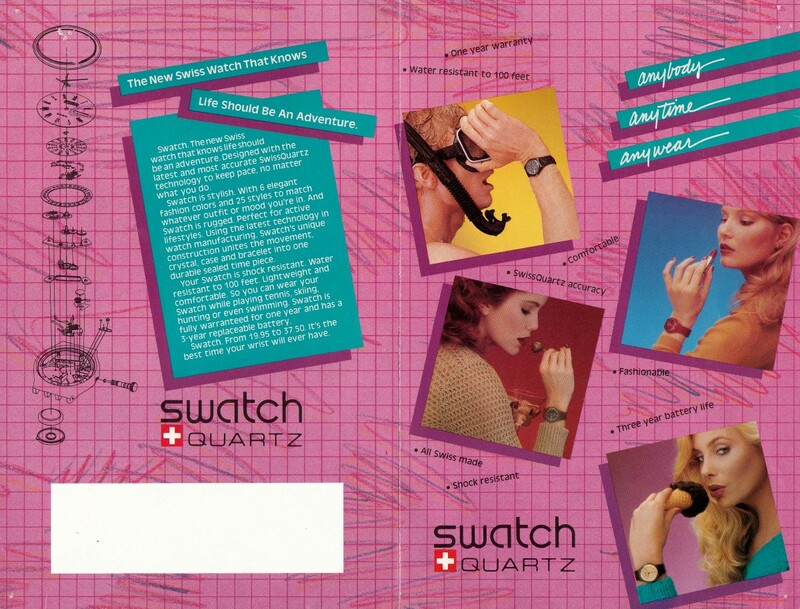 I am not sure if it is the first Swatch advertisement leaflet ever. 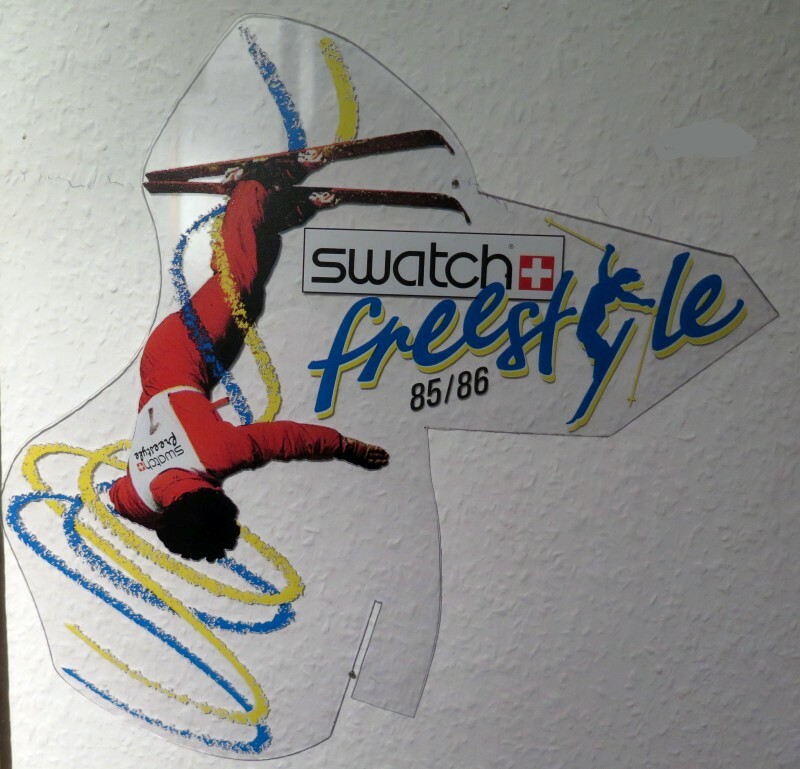 It is clearly designed in the that 80s style... 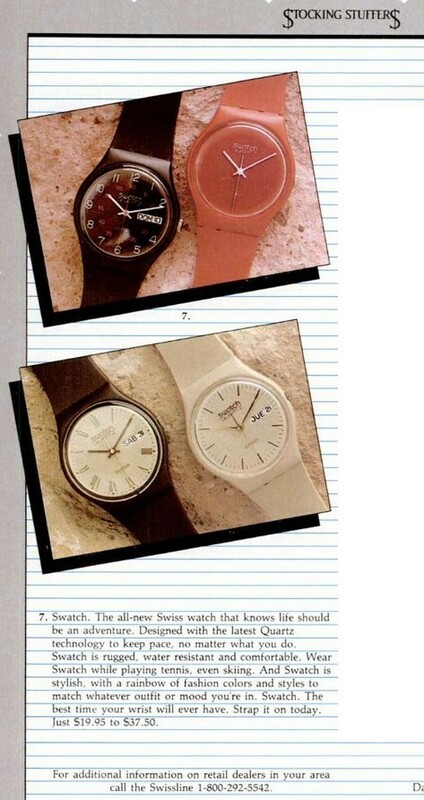 I think that it is very interesting that seven different prices ($19.99, $24.50, $27.50, $29.95, $32.50, $34.50, $37.50 US) were used. 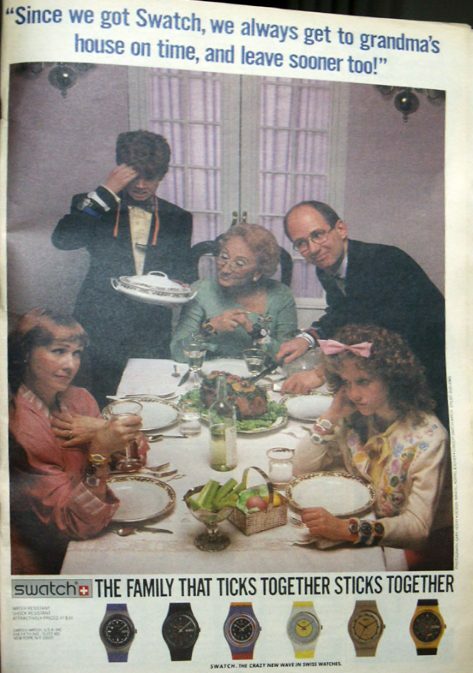 The metallic faces were the most expensive... 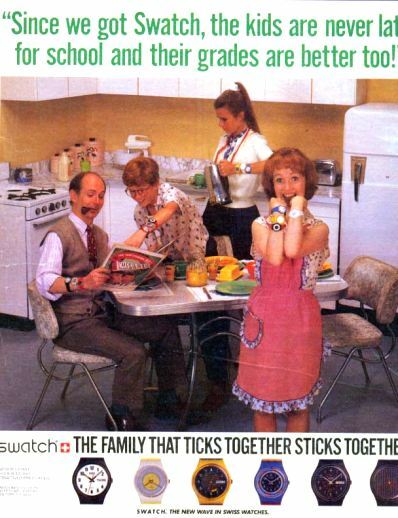 Note that the ref.no.s are different to the ones that we know today! 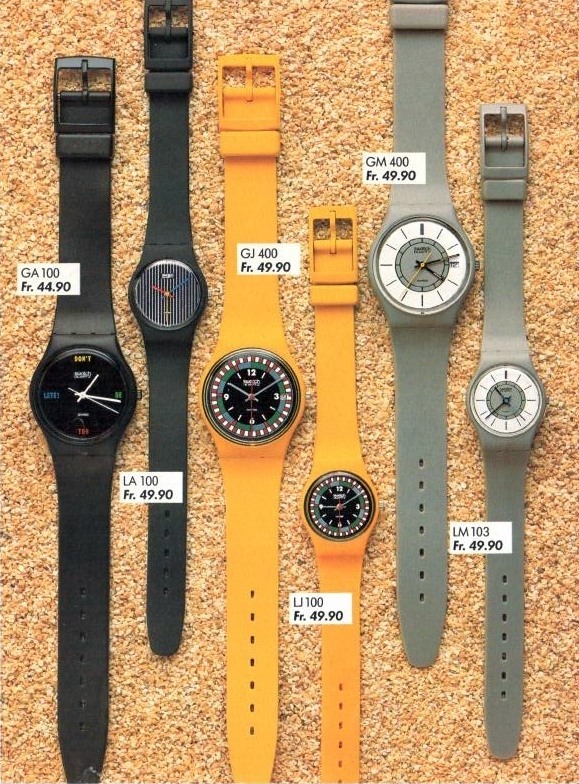 The cheapest one ($19.99, GB012 = GB001) is not pictured. 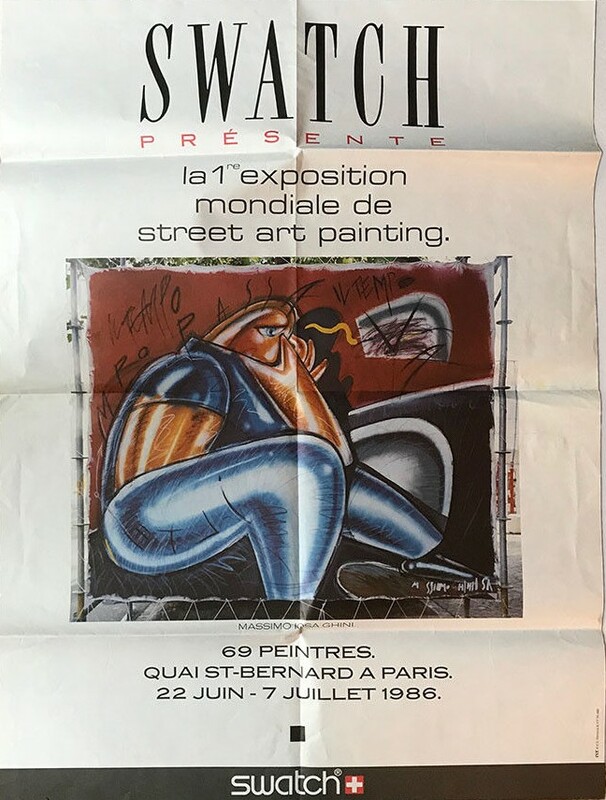 And you can see that the collector who used this leaflet to check the details of his collection is also missing the pieces that are extremely rare today. 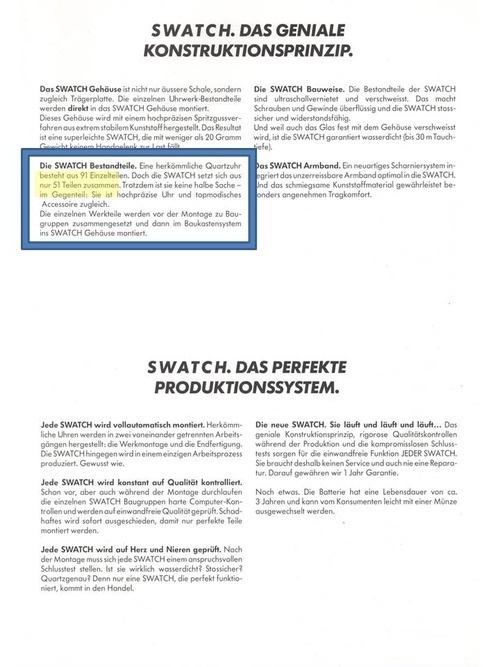 The following is not exactly an ad but very early press material (4 pages) from the Swatch launch. 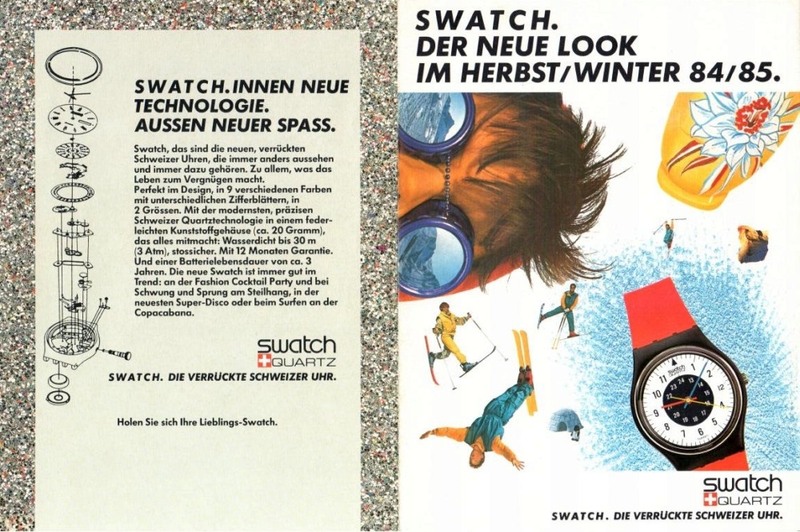 You can find it in Sistem51: Swatch as Swatch can, a nice blog post (in German) where Gisbert L. Brunner describes the development from the original Gent Swatch in 1983 up to SISTEM51 in 2013. 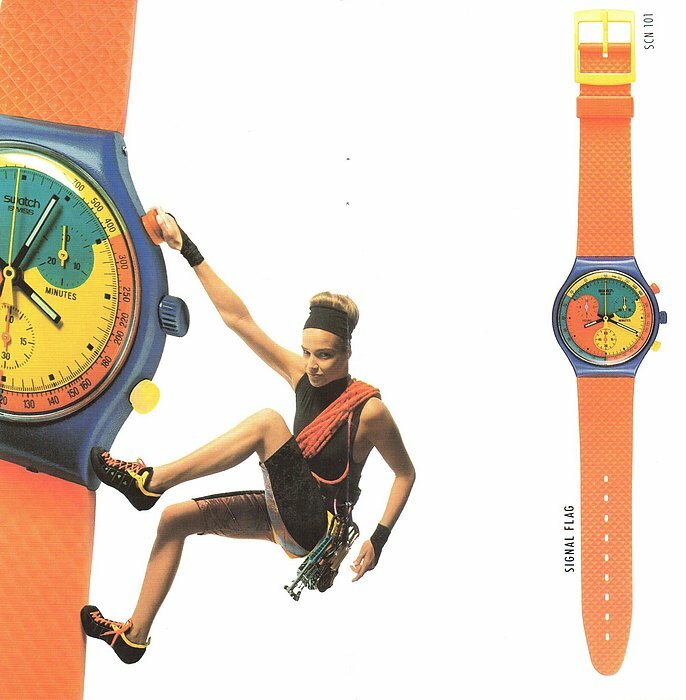 It is not the original 1982/83 press material as it shows a Classique (GB703RE) and a Jelly Fish (available in late 1984 / early 1985). 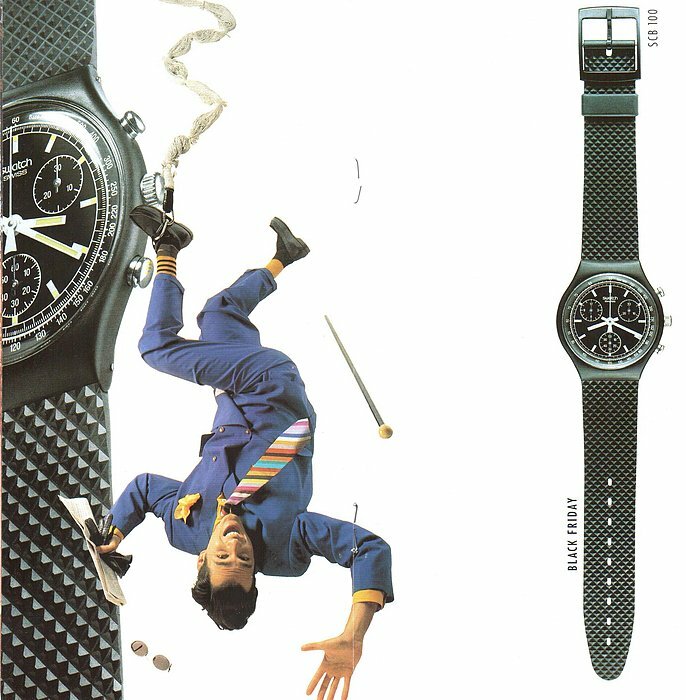 Below is a very early ad from Germany: It appeared in the men's lifestyle magazine Penthouse (DEC-1983). 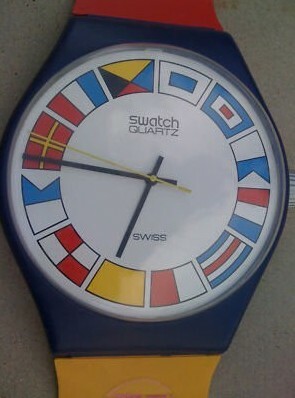 Original sales price of a Swatch watch was 49,90 DM (German Mark, approx. 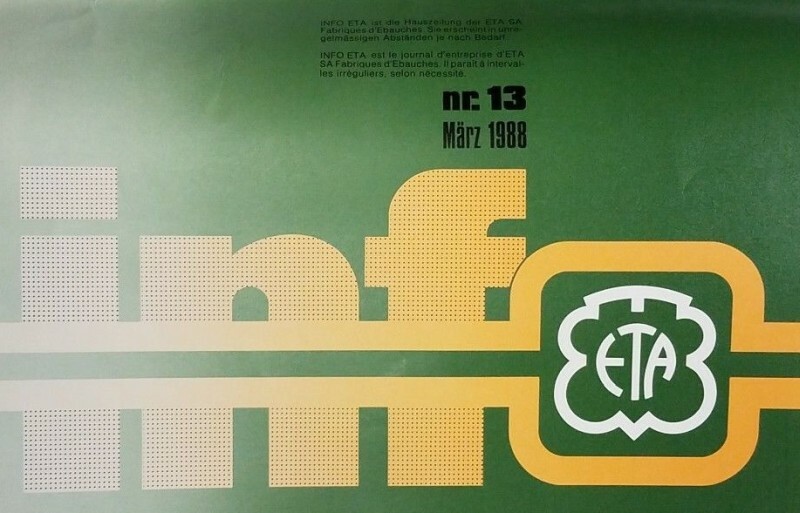 25 EURO). 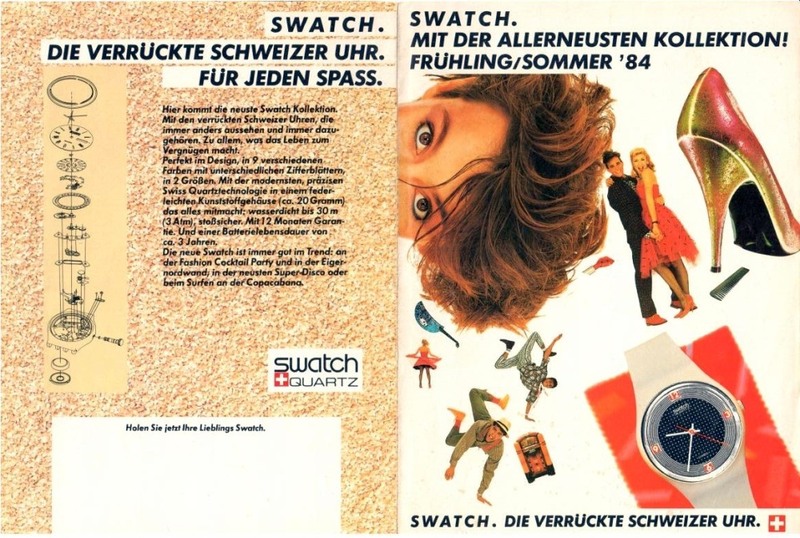 The sales of Swatch watches in the UK started in March 1983. 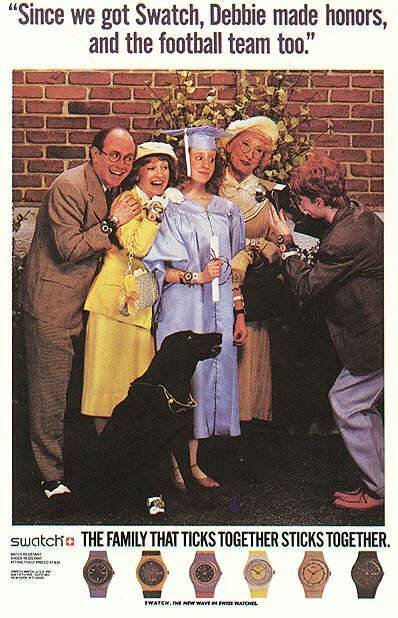 This is probably the first, four page foldout leaflet that was handed out. 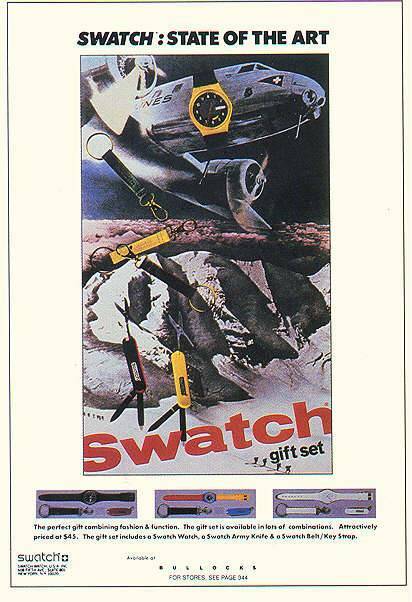 Back then, Swatch watches were distributed by "Avia International Division, Louis Newmark plc, 15/25 Ormside Way, Redhill, Surrey RH1 2QA". 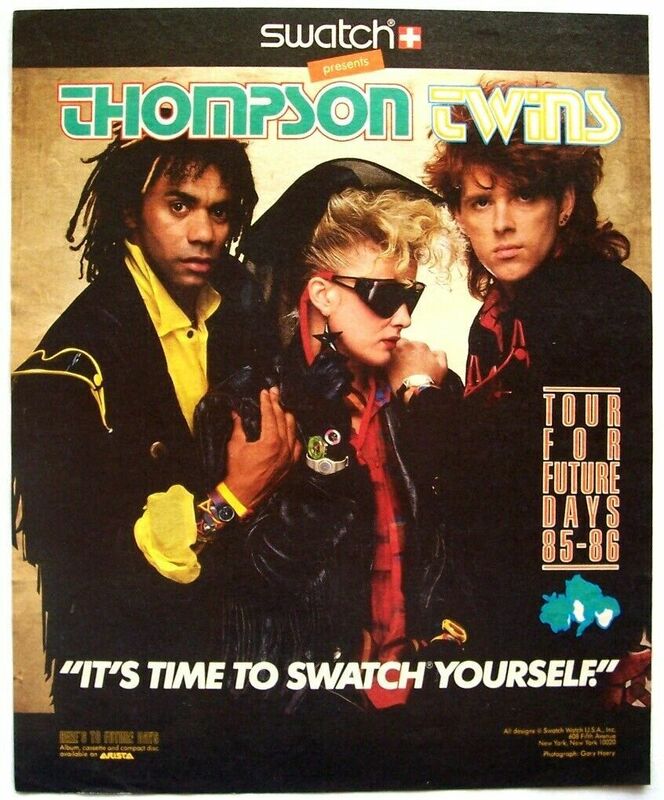 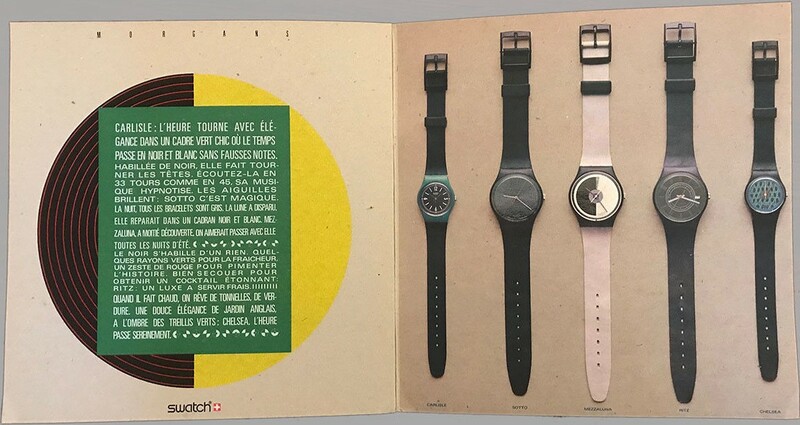 The following six page foldout leaflet was distributed in early 1984 in the UK as it shows some 1984 Swatches. 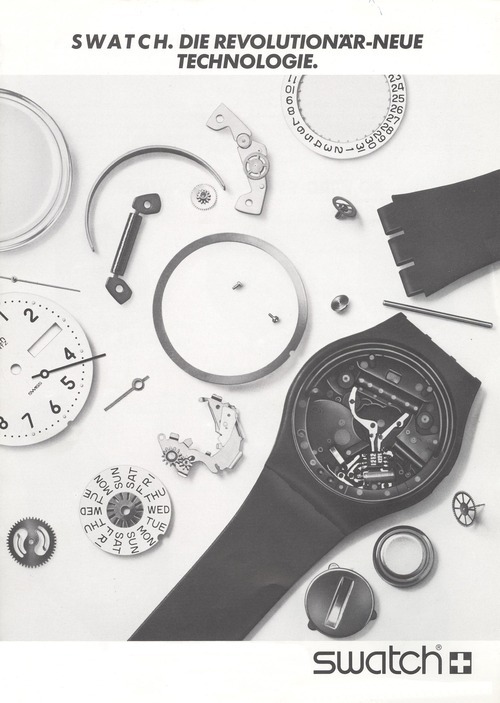 The watches are not listed with their common names such as GB001, GR700, GT702, ... but with a unique six digit number such as 650071, 651471, 650771, ... 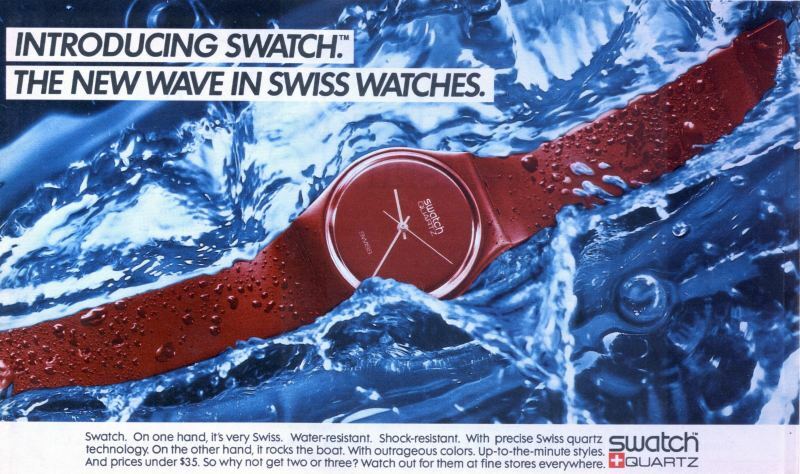 These six digit number were probably introduced by the UK distributor called Avia International Division. 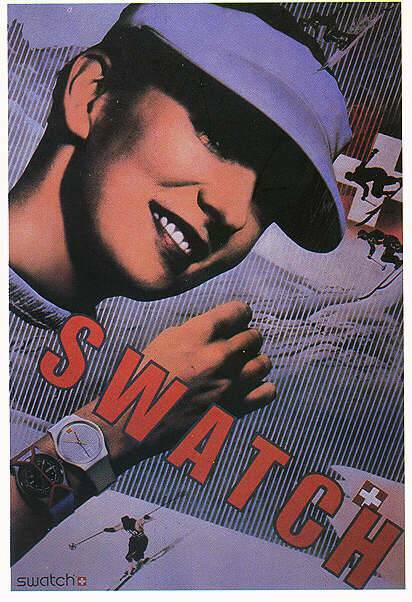 Back then, Swatch was not operating as a company in all countries where it was selling watches. 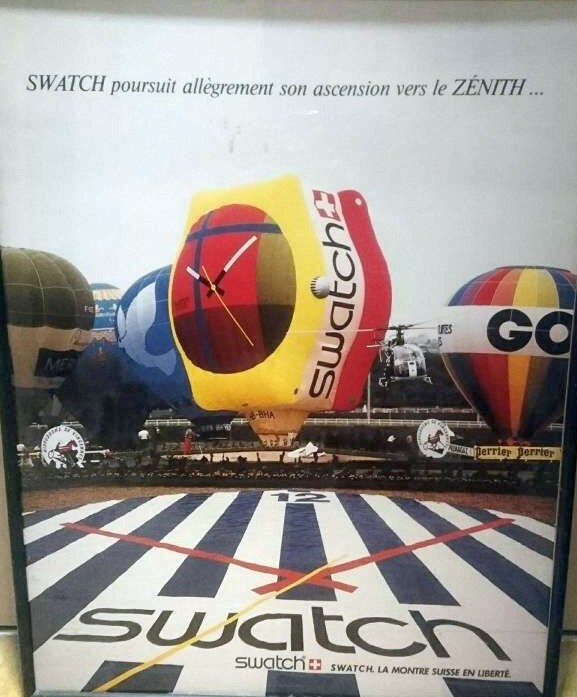 Swatch used local distributors instead. 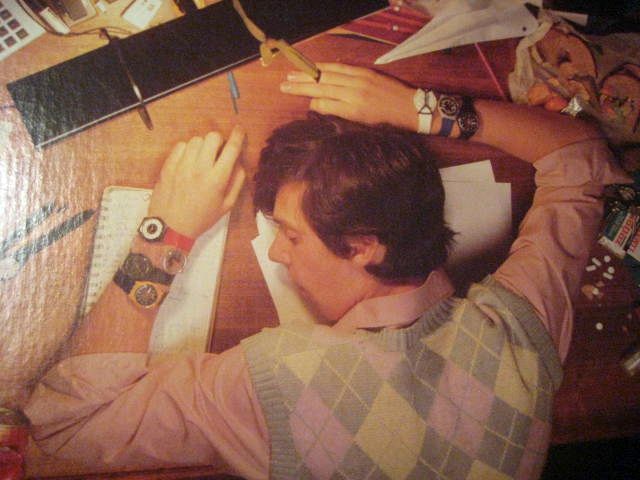 You will see those six digit numbers again on the pictures of two early blister packagings below. 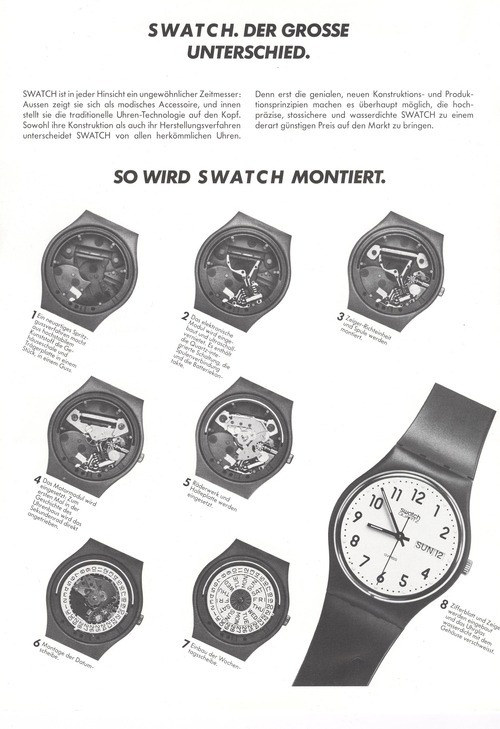 Shortly afterwards, each Swatch got a unique name and those six digit numbers were quickly forgotten (and the same ref.codes were used all around the world). 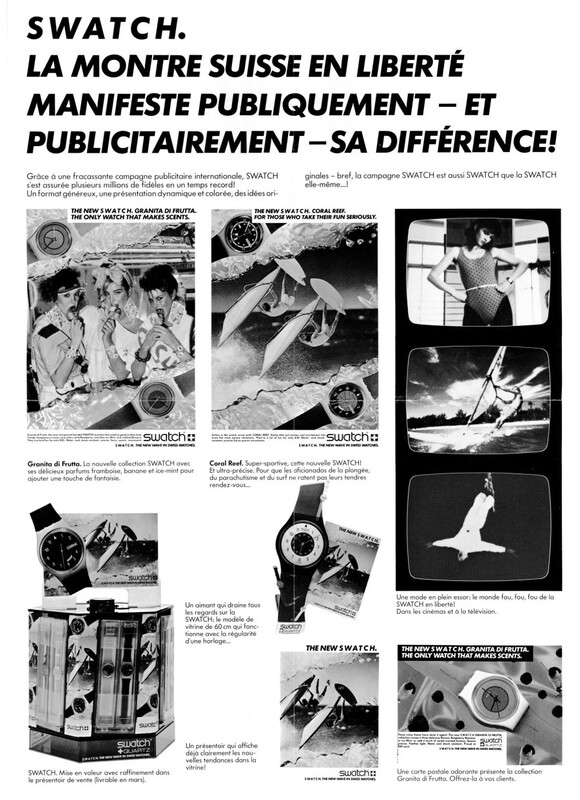 at least one variant is shown on the second picture: The GB001 in the upper has a red second hand. 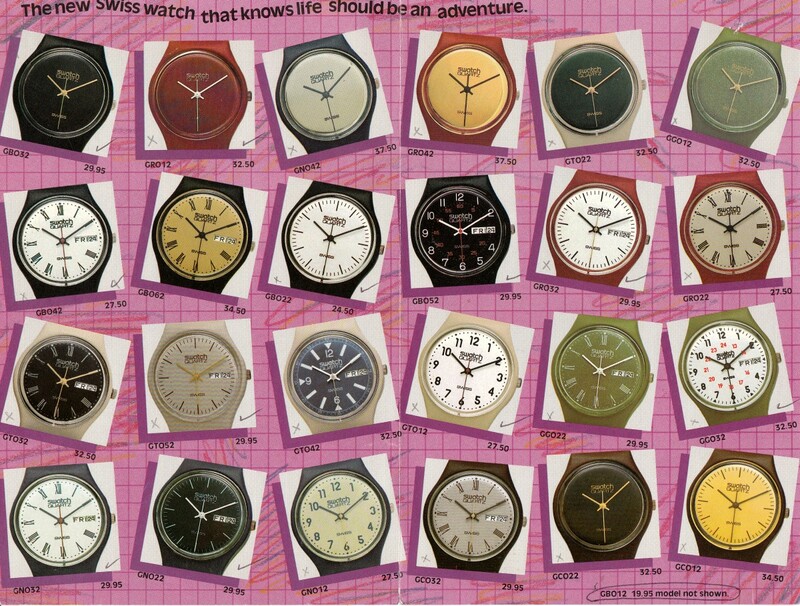 This is a rare variation, also known as GB001V1 or GB102. 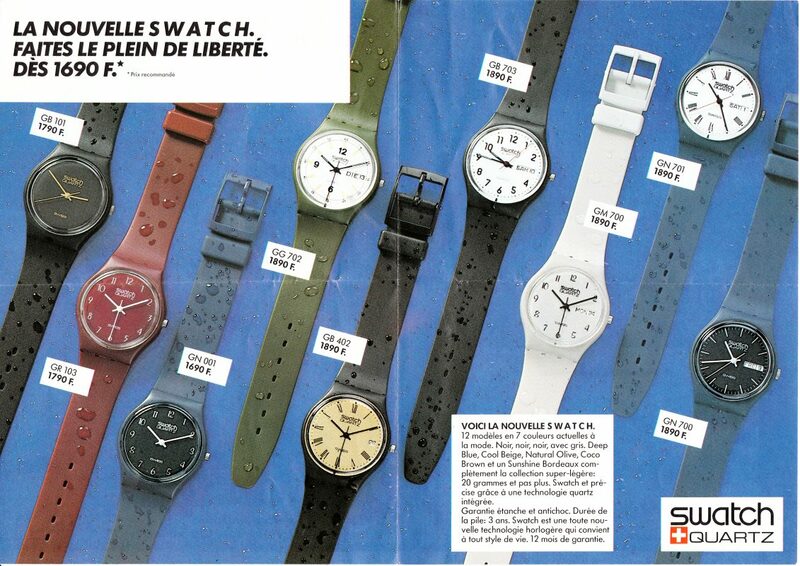 Can you spot other variants? 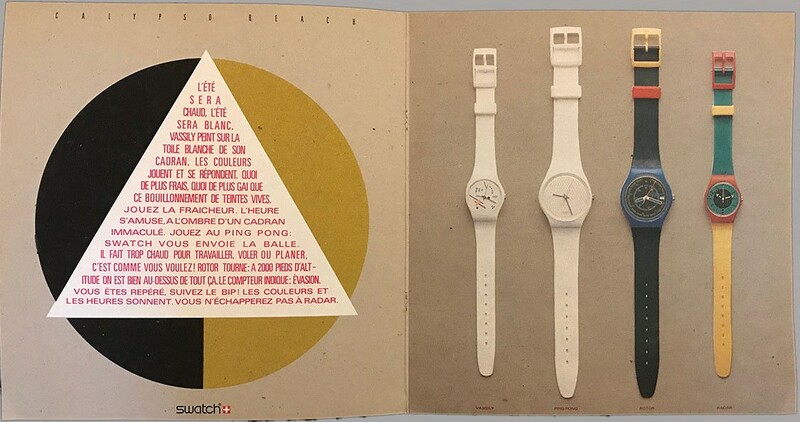 Below are two early blister packagings for Swatch watches. 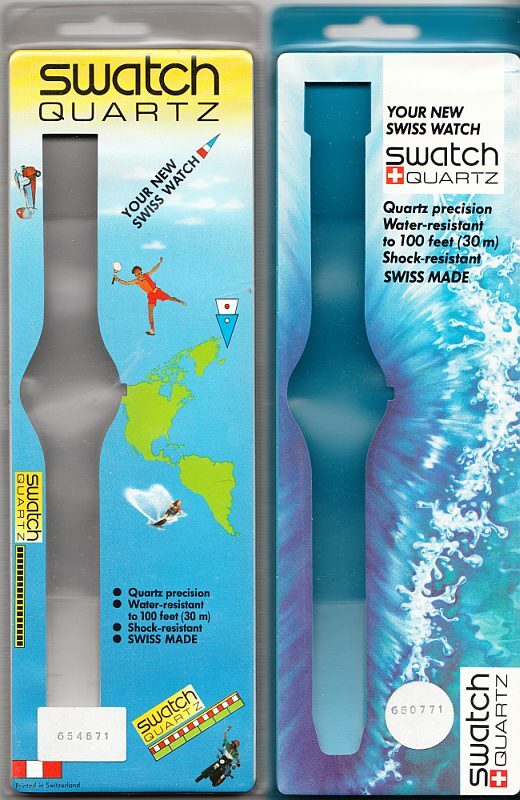 These specific packagings were sold in the UK as they carry a round sticker with that six digit number. 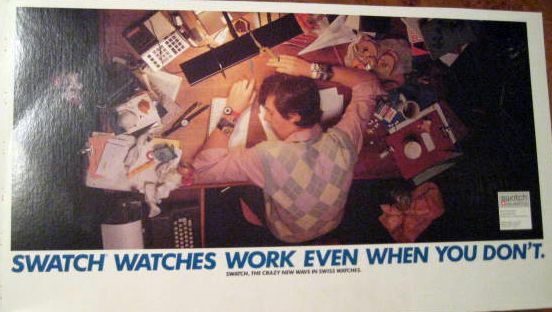 In this case: 654671 and 650771. 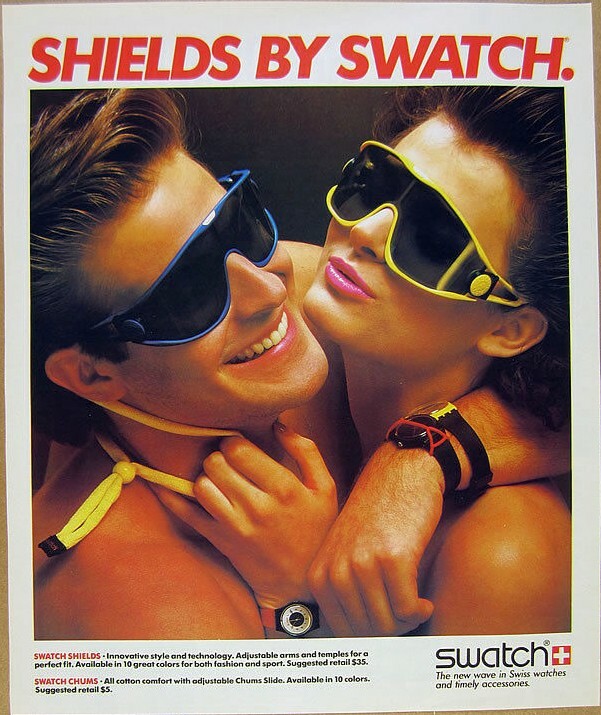 So these two packagings originally contained a GB705 (concluded from the price sticker on the back [19.95 UKP! 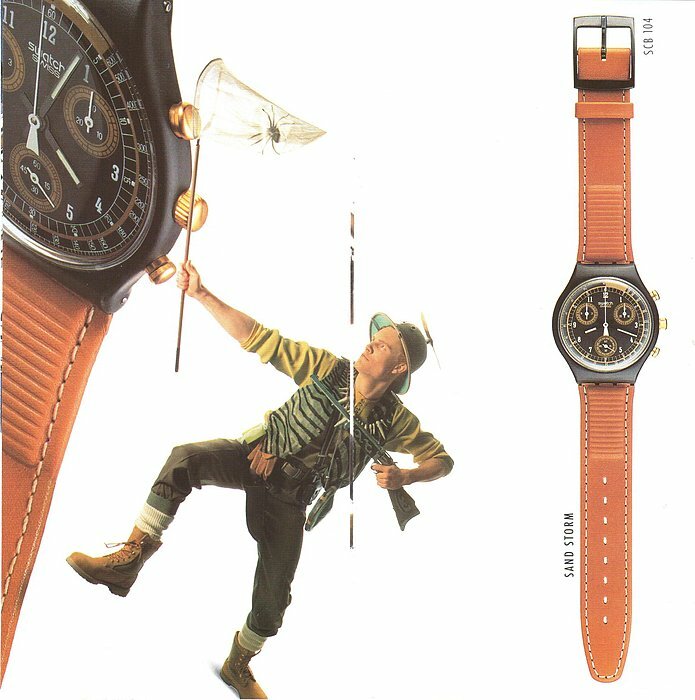 ], not in the leaflet above) and a GT702. 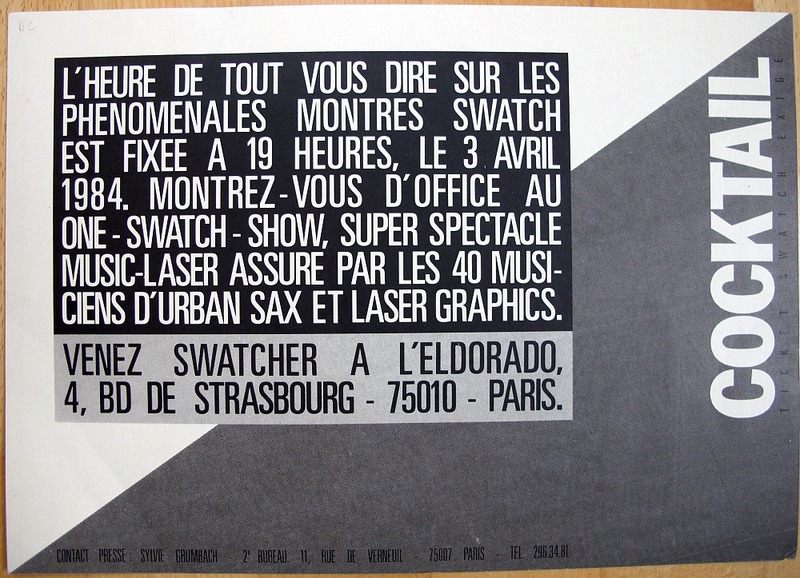 Below is a large invitation card for a Swatch launch event in Paris, France on 03-APR-1984. 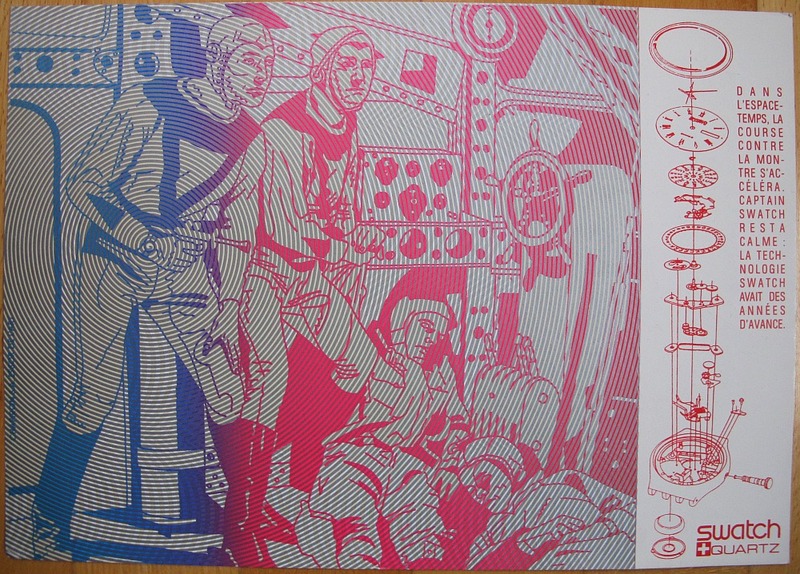 Size is about 22 x 32 cm. 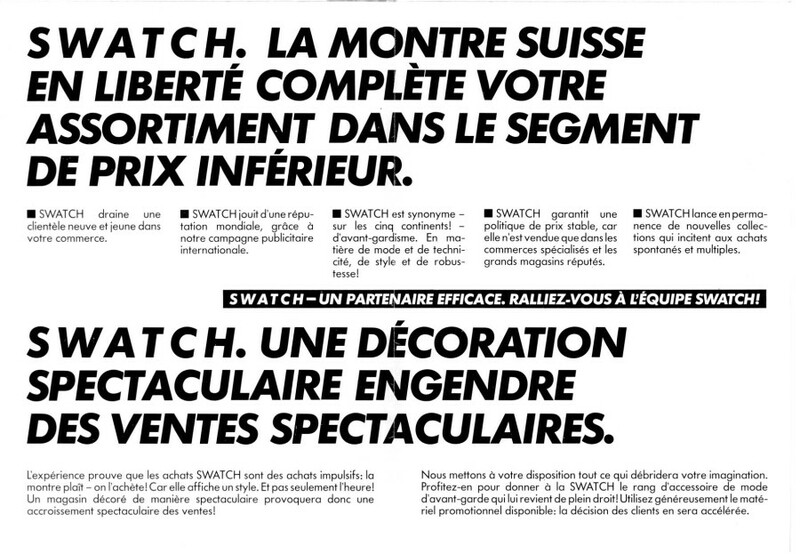 Is it the first time that Swatch watches were available in France? 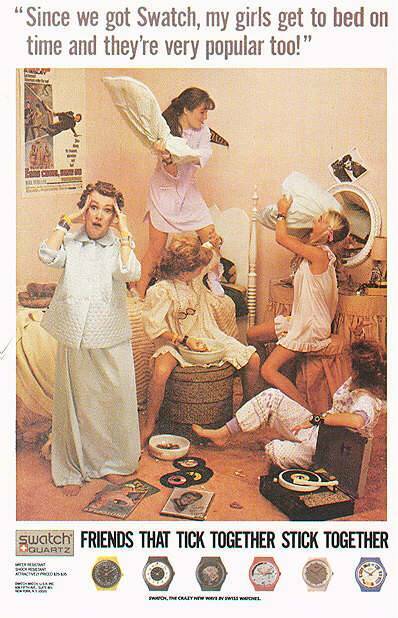 I assume not (but I just can't find it in the books). 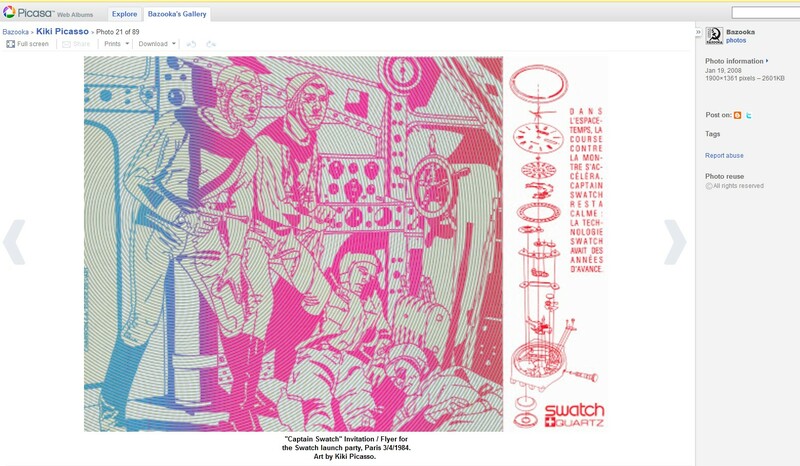 According to this website (screenshot), this invitation was designed by Kiki Picasso! 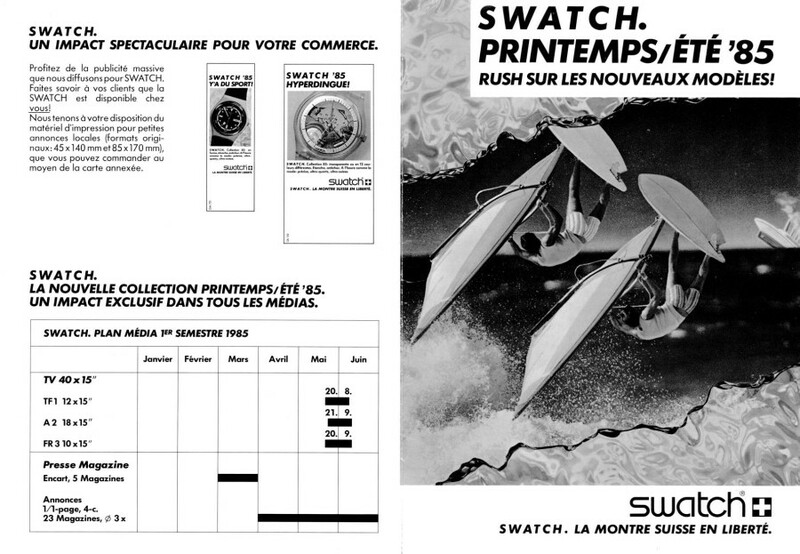 French press map (16 pages, card board) for the 1986 Swatch collection, very rare! 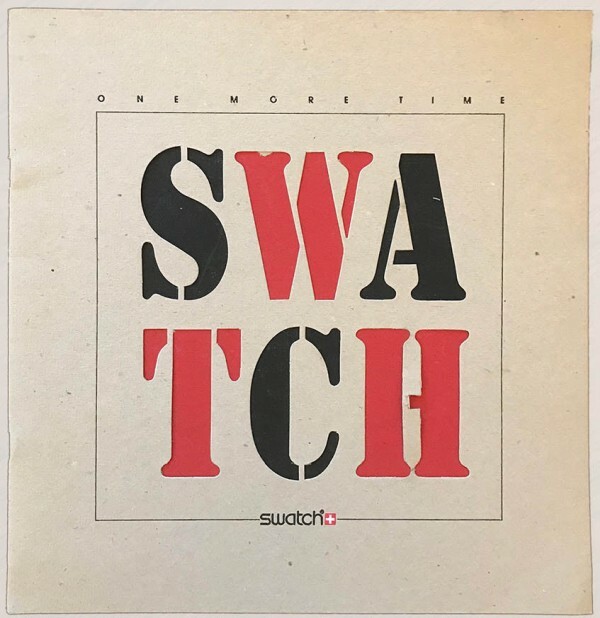 This is an advertisement for the Swatch Watch New York City Fresh Festival 1984, Hip-Hop's first national tour of the US, including artists such as The Fat Boys, Run D.M.C., Curtis Blow, Whodini, ... 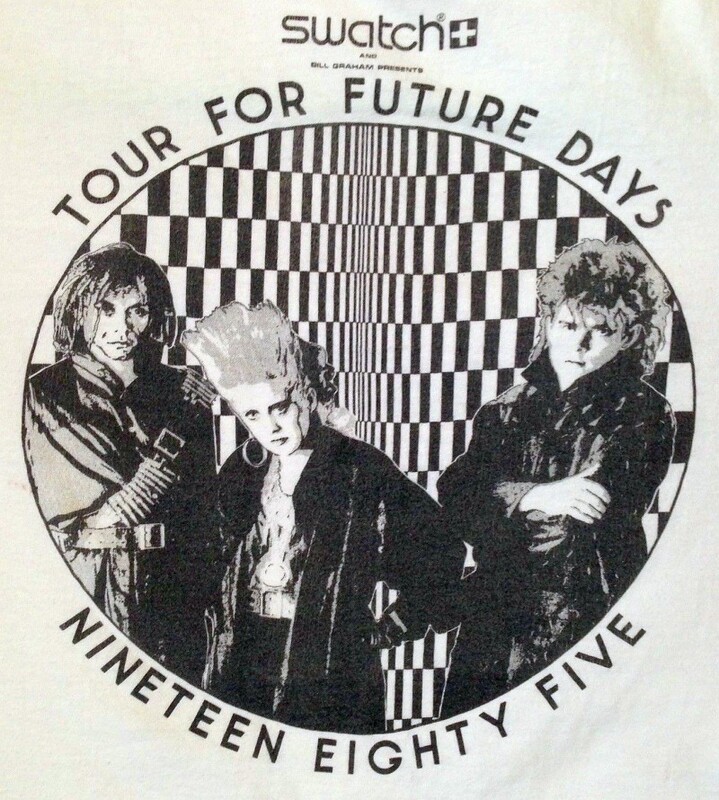 This one is from the tour stop on 07-DEC-1984 at the Sports Arena in San Diego, CA. 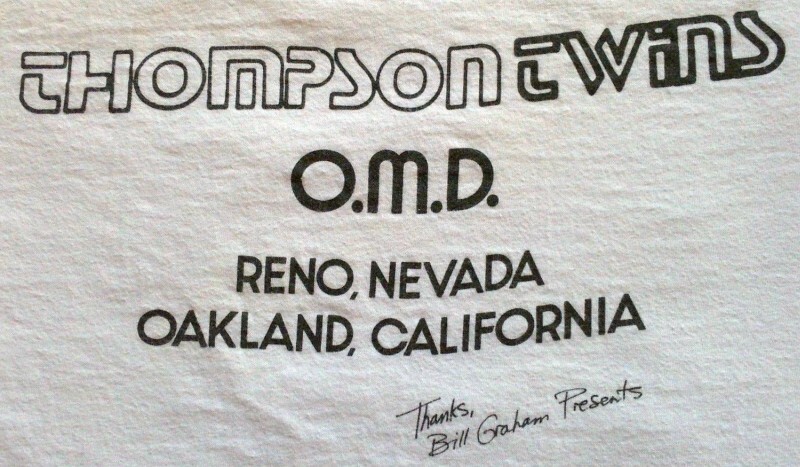 Another tour stop was at the Oakland Coliseum Arena on 09-DEC-1984. 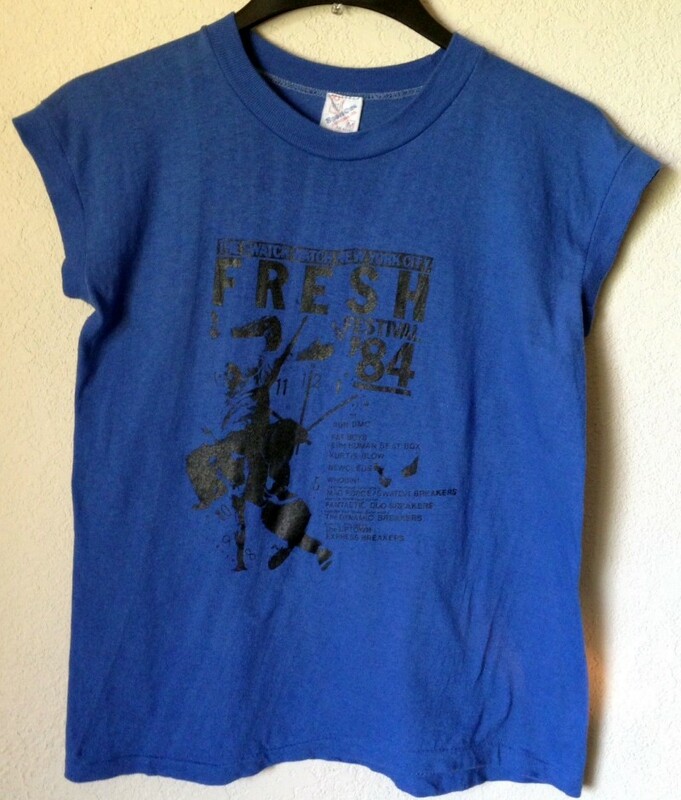 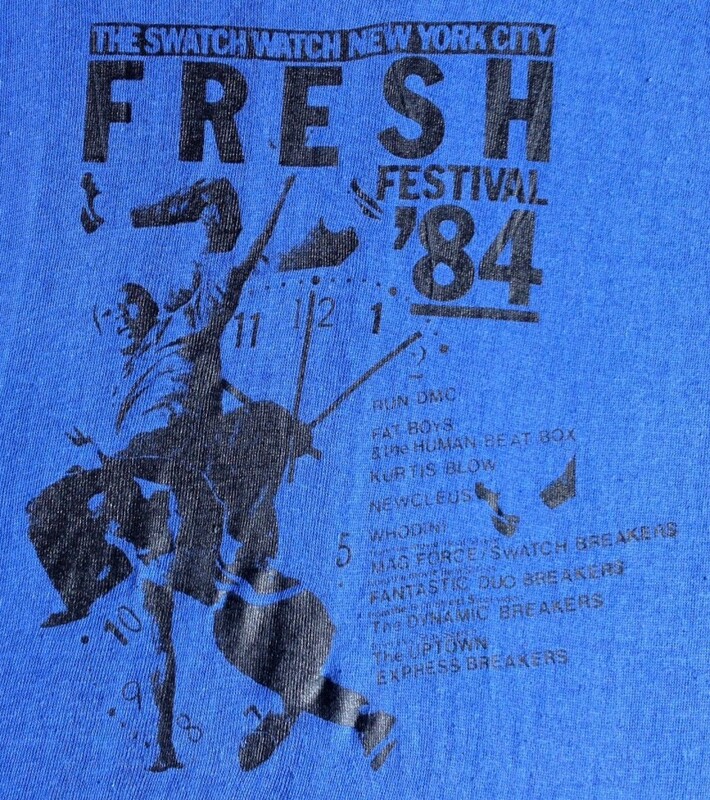 Some general information about this tour: The 1984 Swatch Watch New York City Fresh Fest, Hiphop’s first national tour, debuts Labor Day weekend (early SEP-1984) in Greensboro, NC. 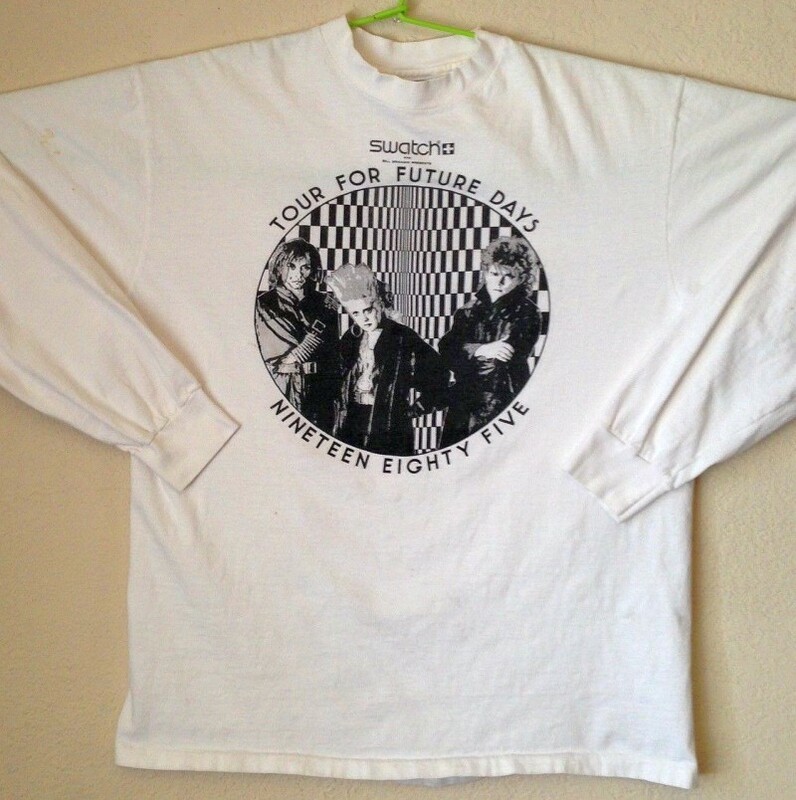 Including 27 dates through Christmas, the tour featuring Run D.M.C., Kurtis Blow, Whodini, the Fat Boys, Newcleus, and New York’s Dynamic Breakers grosses $3.5 million US. 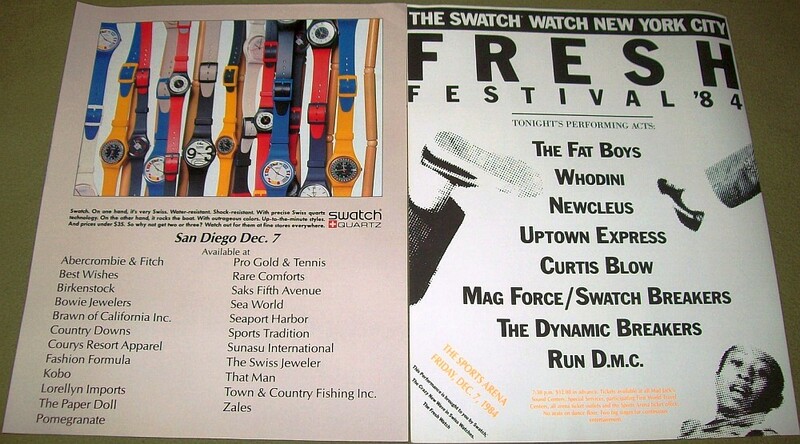 Later, the Fat Boys sign an endorsement deal with Swatch. 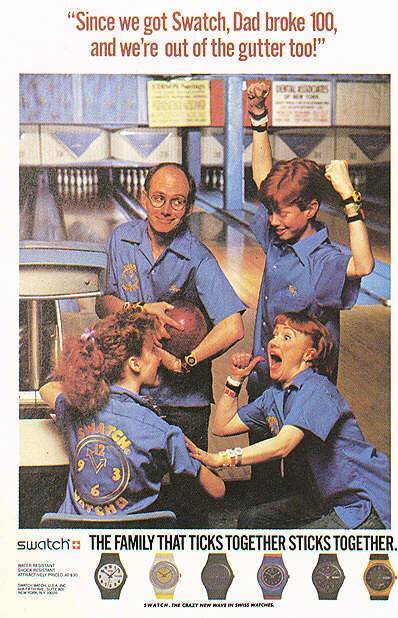 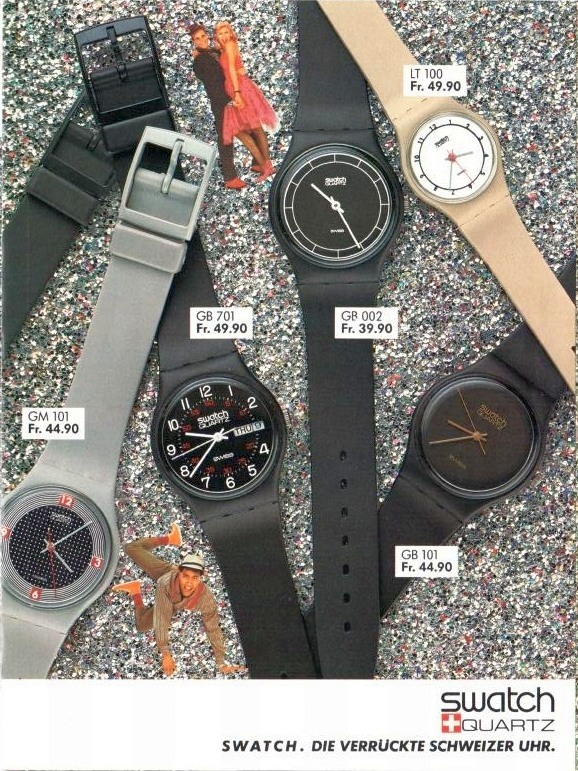 The next three ads are from the USA, showing the 1984 collection. 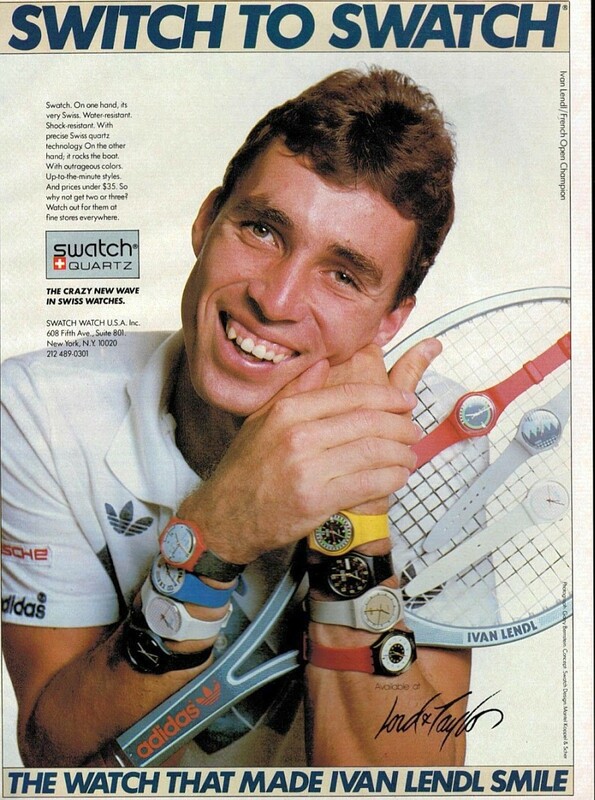 The first ad features the famous Tennis player Ivan Lendl wearing eight(!) 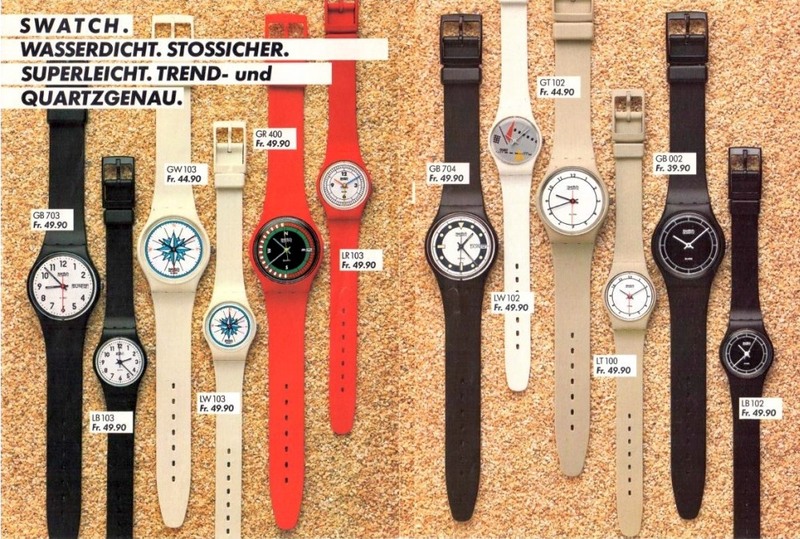 Swatch watches. 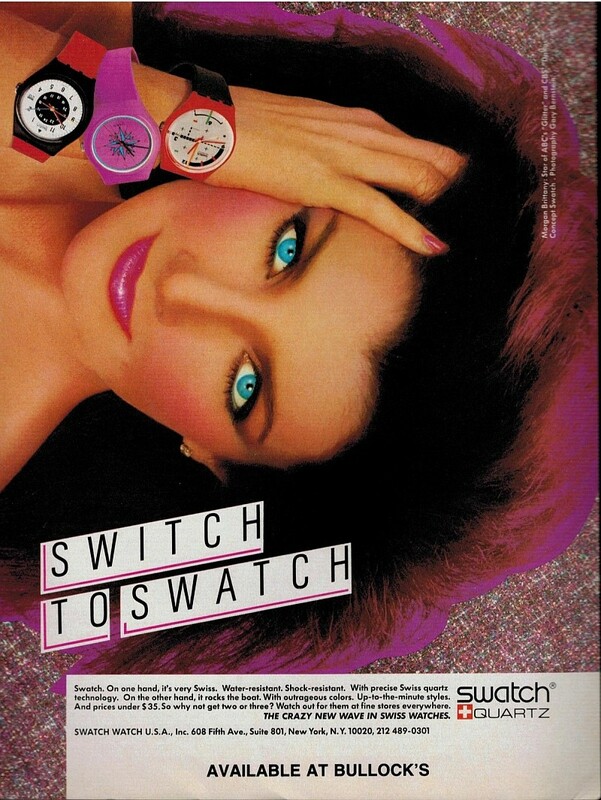 The second shows a PINK Windrose Gent Swatch (very strange! 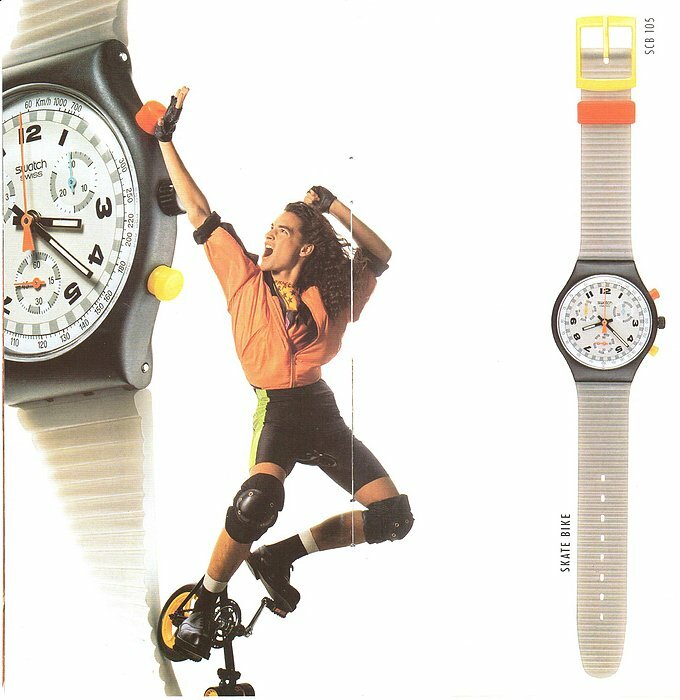 I am sure that no proto in this colour exists). 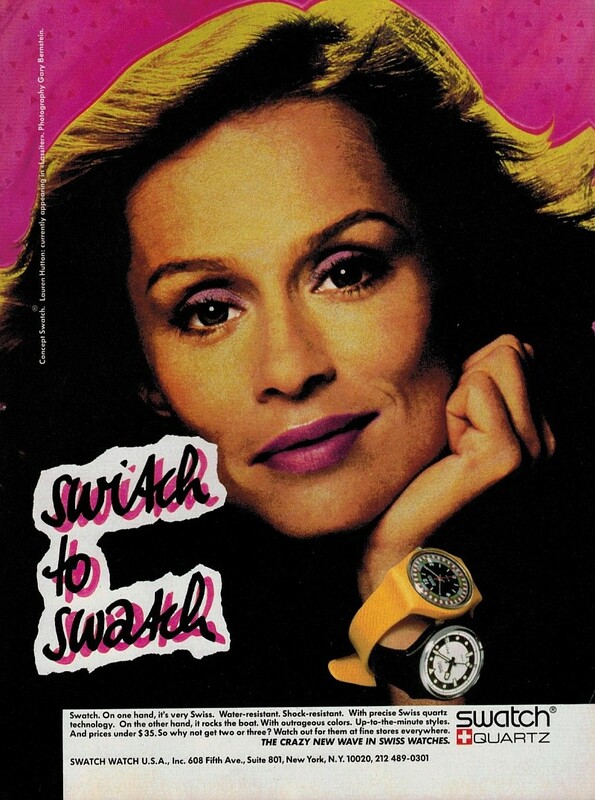 The third one features actress Lauren Hutton. 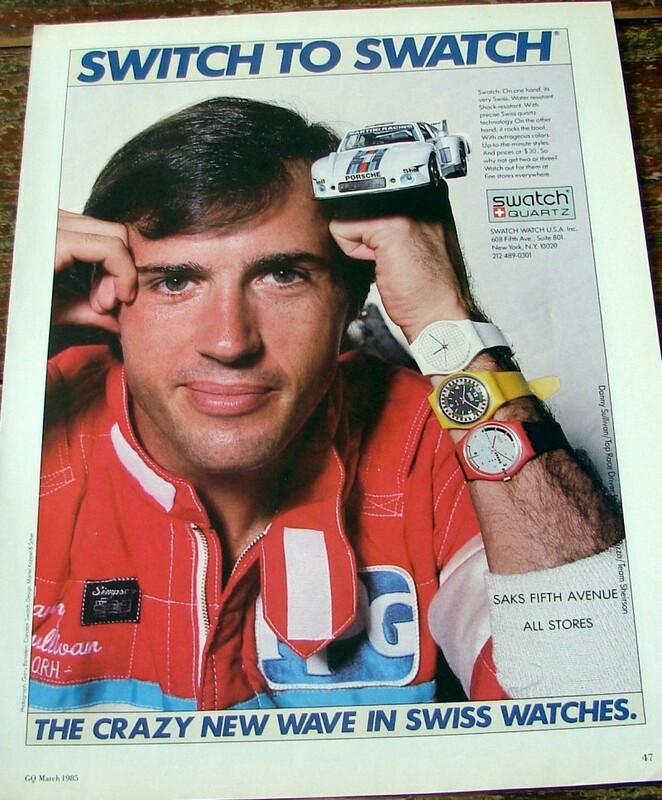 The fourth one shows "Top Race Driver" Danny Sullivan (winner of the 1985 Indianapolis 500). 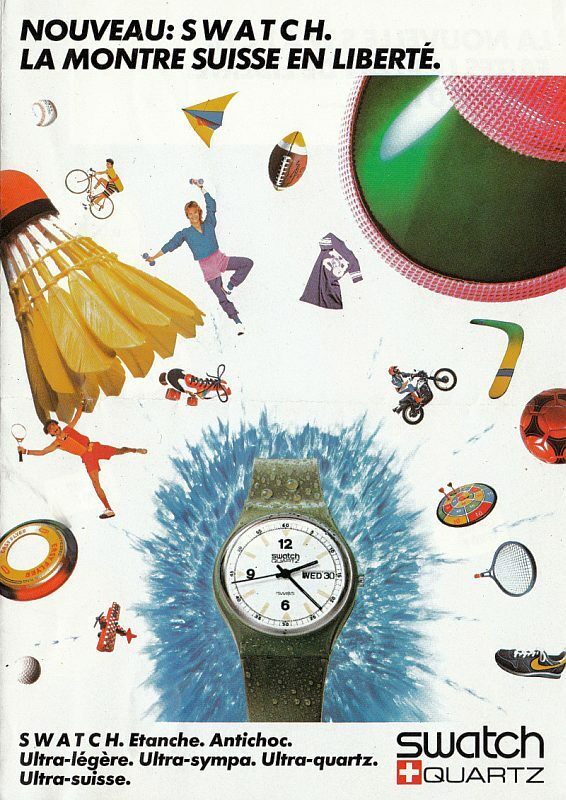 An ad from 1986 by the US department store chain Bloomingdale's, advertising the "Swatch Signature Collection of Clothing and Accessoires". 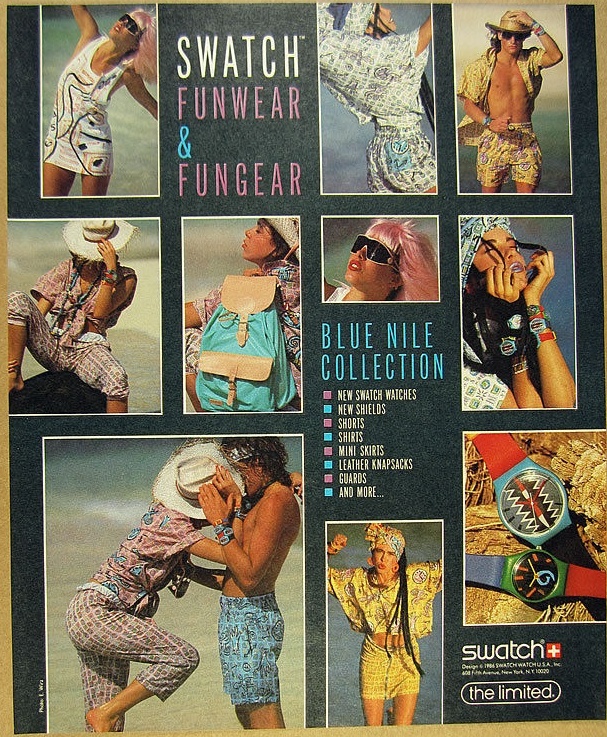 These Swatch accessoires were very popular back in the day. 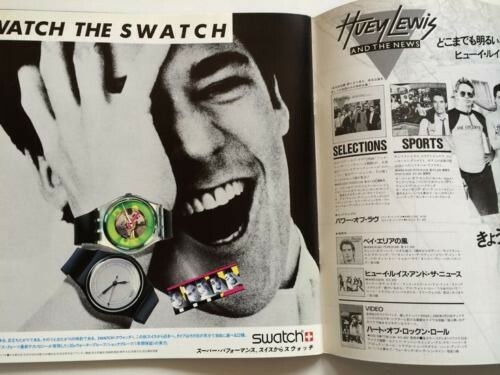 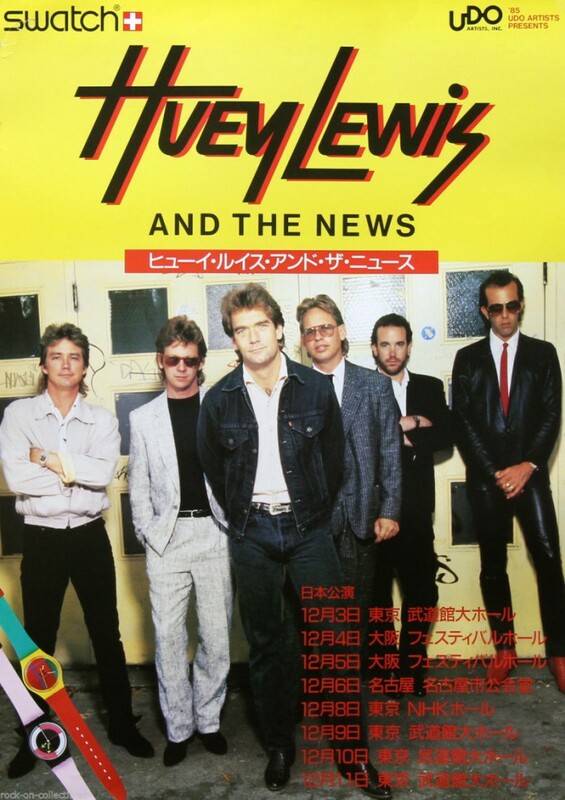 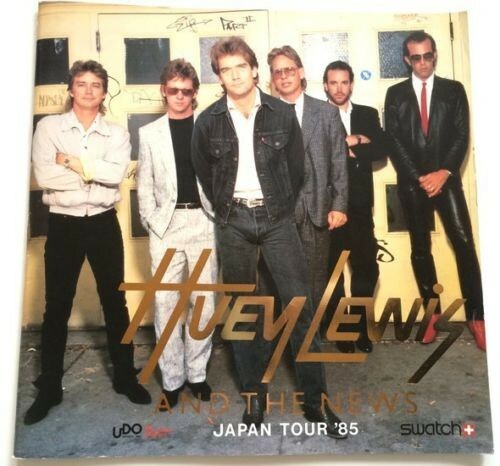 In 1985, Swatch was a sponsor of the Japan tour of Huey Lewis and the News. 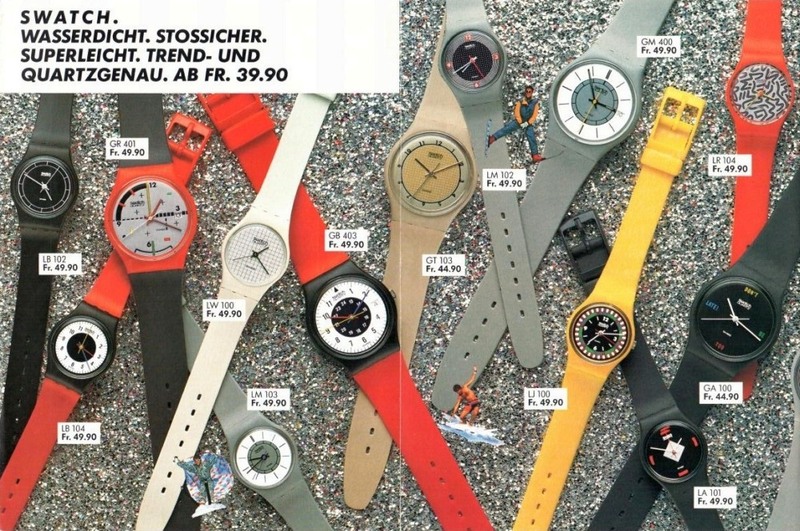 The following ads were used by swatch in the early 80s (84/85 to be precise; we can recognize favourite swatches such as 12 Flags, Computech, Yellow Racer etc.). 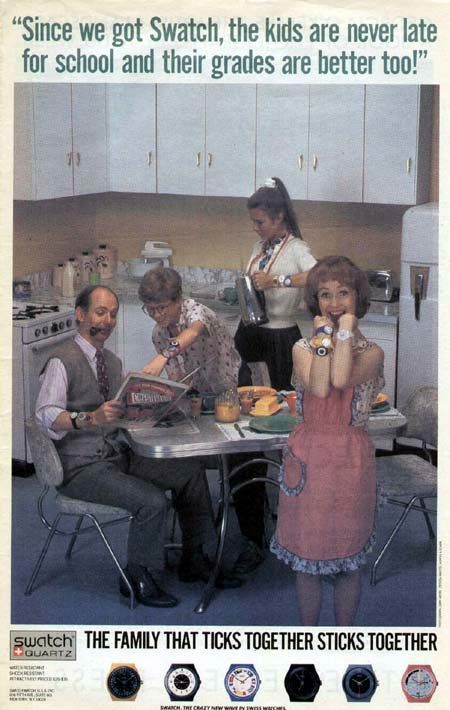 They are quite good! 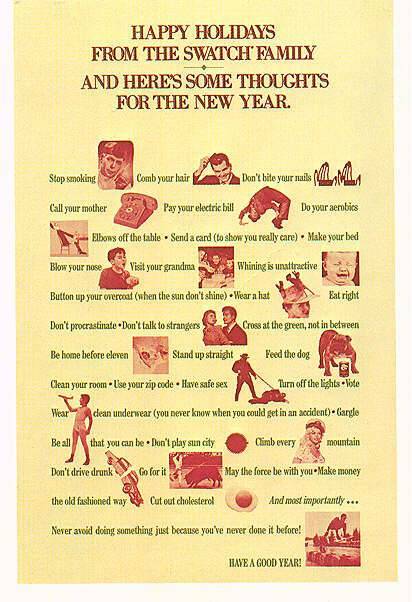 So take your time to download them! 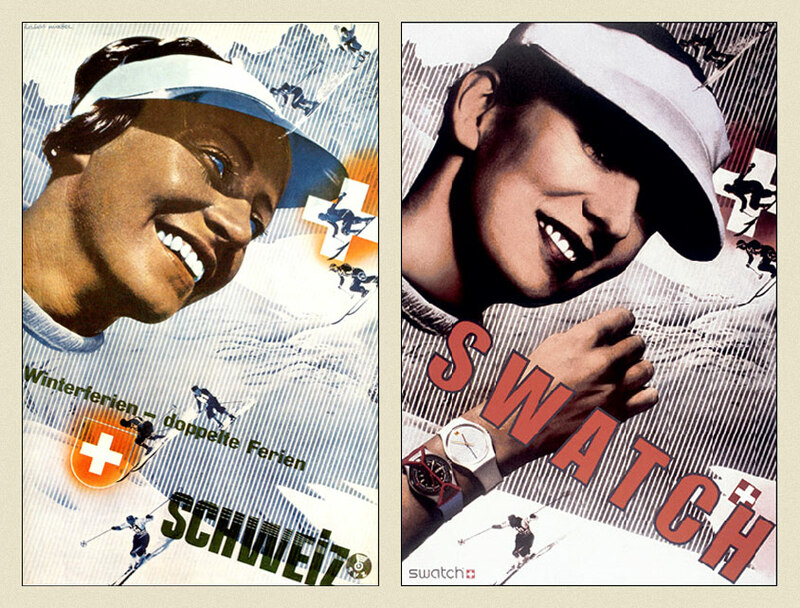 These ads have an interesting story They were designed by Paula Scher, a well known graphic designer from the US. 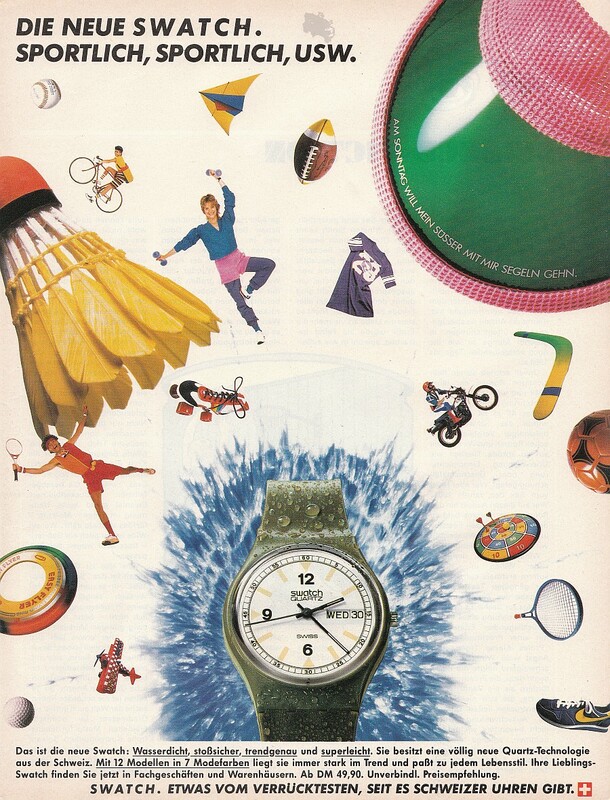 In 1984 she co-founded Koppel & Scher with editorial designer and fellow Tyler graduate Terry Koppel. 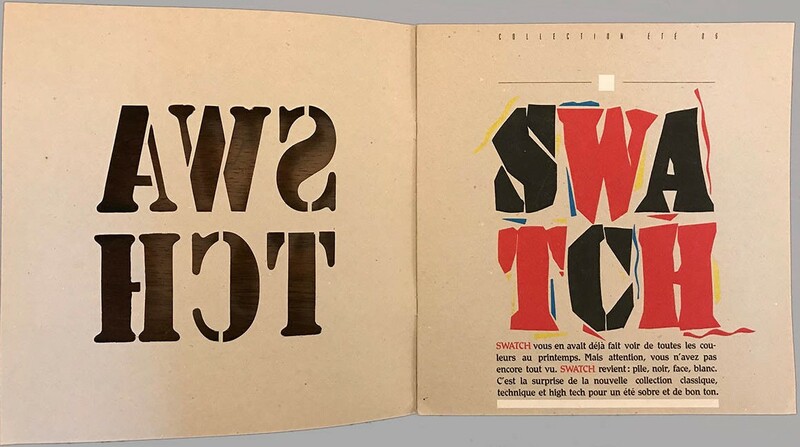 During the six years of their partnership, she produced identities, packaging, book jackets, and even advertising, including the famous Swatch poster based on previous work by Swiss designer Herbert Matter. 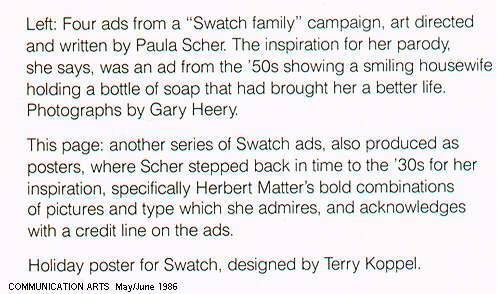 Here is a very interesting article about the work of Koppel & Scher for Swatch. 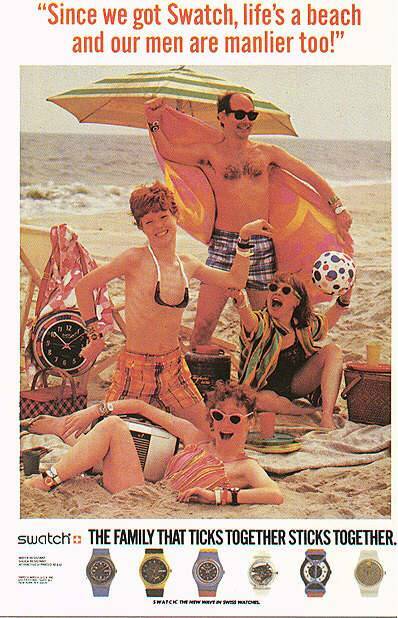 Thanks to Brian Pier for the pictures. 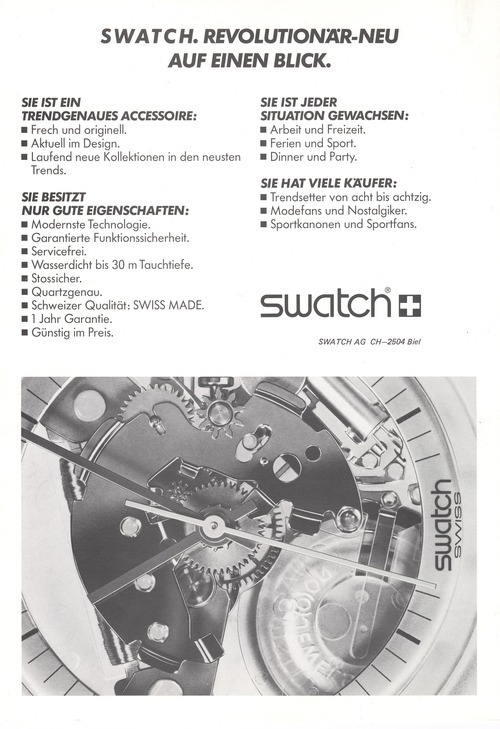 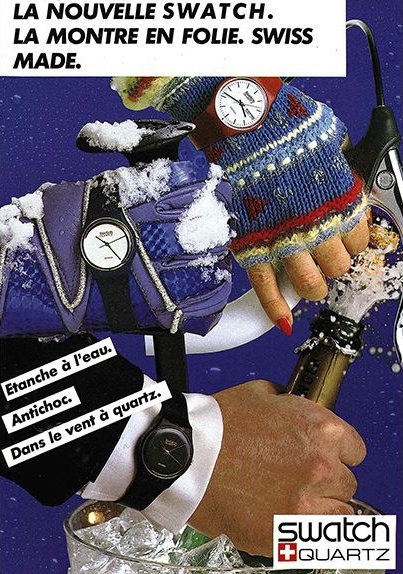 Below are the ads for the first Swatch Chrono collection in 1990. 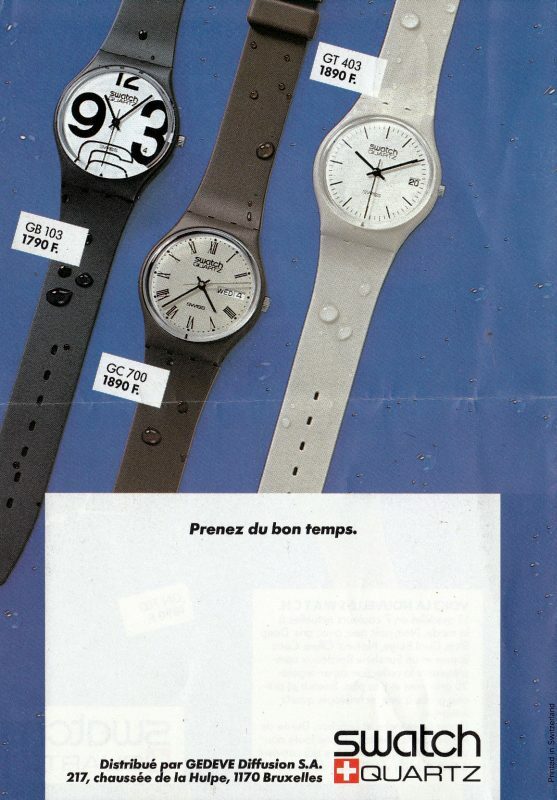 The Chronos were a huge success back then and they sold out immediately. 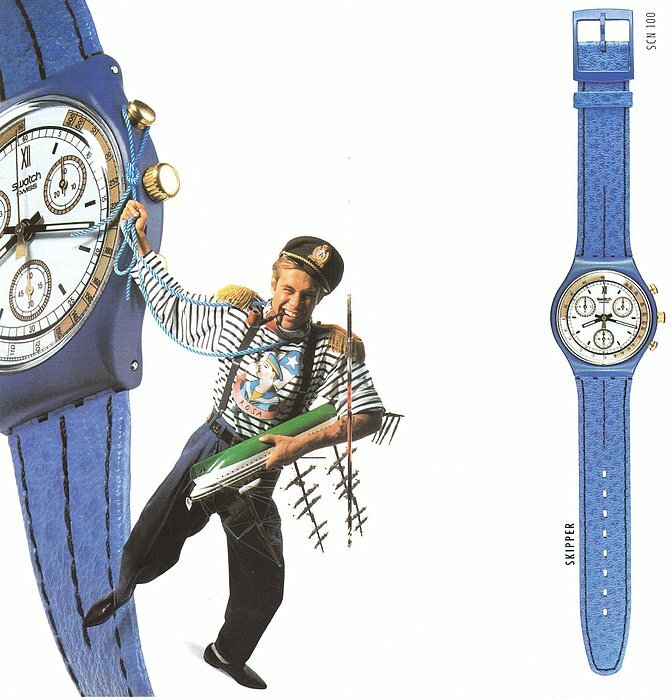 Note that a few watches (White Horses, Skate Bike and Signal Flag) show the very rare dummy variant with coloured buttons / crown instead of the chromium ones of the regular watch that was sold later. 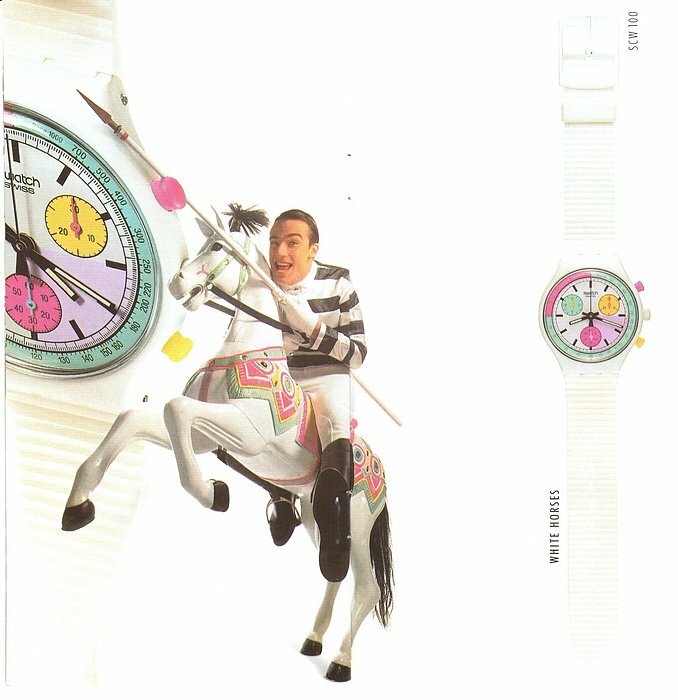 The three small hands of the White Horses Chrono also have different colors compared to the regular watch. 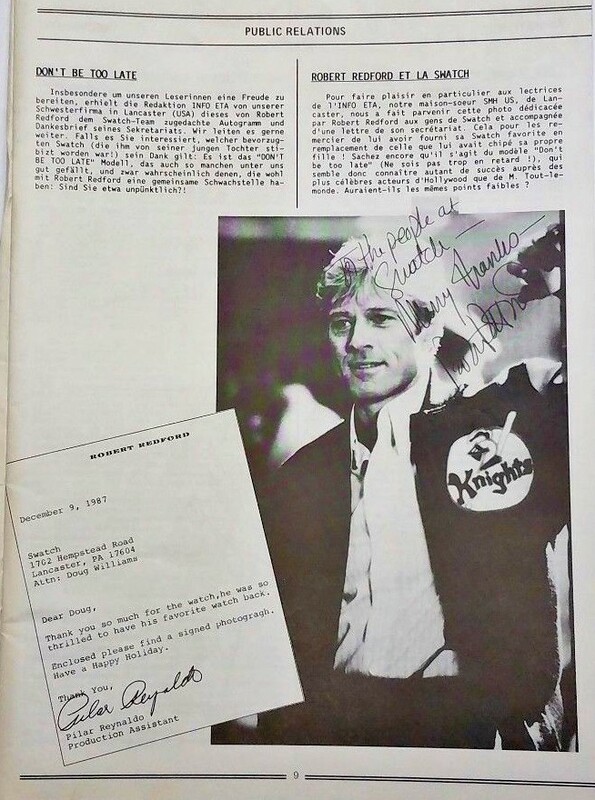 Thanks to Christine Tanner for a few pictures and to Hans van Buuren for additional information.